Since the announcements and public previews of Microsoft Azure Stack (MAS), everybody including myself is talking about and testing with MAS. 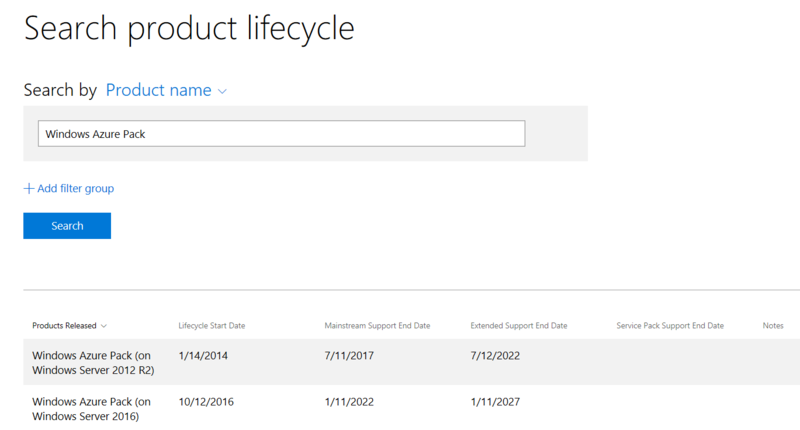 But the reality is that a lot of companies have invested in Windows Azure Pack and were a little surprised that Microsoft announced before this summer that Windows Azure Pack on Windows Server 2012 R2 is supported until July 2017. From several customers i received questions about the support statement and what needs to be updated. Turns out it’s not that well documented and known. 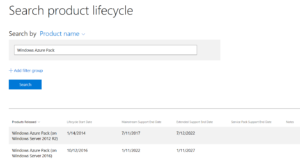 As you can see in the screenshot above, it states Windows Azure Pack (on Windows Server 2012 R2) and Windows Azure Pack (on Windows Server 2016). But as we all know, Windows Azure Pack is a solution based on lots of components from the Windows and the System Center family. As i said before Windows Azure Pack leans on a lot of Windows features like a Active Directory domain, IIS and Hyper-V but also on System Center components like VMM and SPF. Another challenging ADFS issue came to me this week. Here the problem was that internal user were not able to authenticate. They receive a login prompt and after providing credentials they received a “HTTP 400 bad request” error message. When users were external and use FBA they were able to login successfully. Also wen internal and the users used a different browser then Internet Explorer the were also presented with FBA and were able to login. Clearly only the login with Windows Integrated Authentication failed. And of course al was working just fine and stopped working about a week ago. 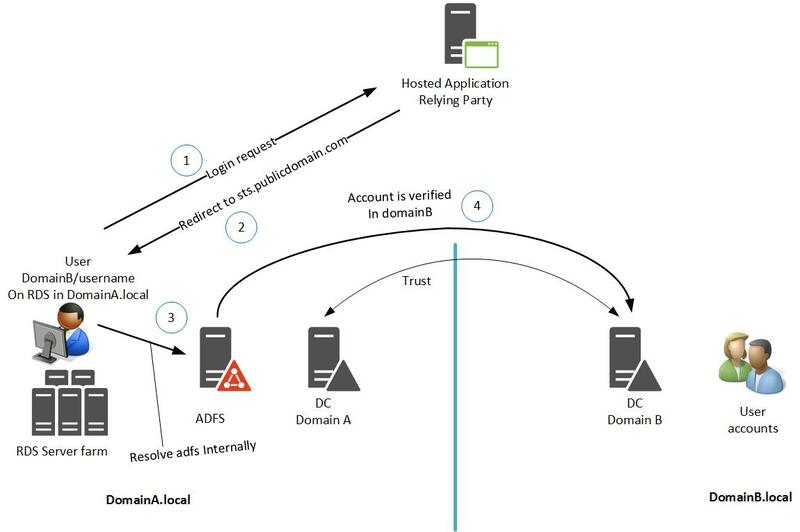 In this environment the ADFS and resource servers were in a different domain than the user accounts were. For more detail see the picture below. Beware it’s only a part of the authentication process to illustrate the topology. A while a go i was involved in a project were the customer wanted to deploy a 2 node Scale out file server with storage spaces on Windows Server 2012 R2. Since this was my first actual storage spaces and scale out file server deployment (besides a training and testing it in a lab with vm’s) i ran in to some issue’s and problems. First of all there is a lot of stuff on the internet that is not always entirely true for all scenarios. Settings or test results that are used and reported are not necessarily true in your environment. For example DCB/PFC/QOS settings with Mellanox RoCe adapters are different than with Emulex RoCe adapters. And even with Emulex and HP or Fujitsu branded Emulex cards configuration is not the same. This could be because the vendors don’t know it exactly either and are still struggling with their drivers, firmware and settings, I don’t know. But it’s makes it pretty tough to get it all right. And as I said before, this is the first implementation I did, so I am not an expert on this either, so feel very free to give feedback if needed. This Technet article describes several does and don’ts with SMB and RDMA. A lot of info and configurations are also available on Jose Barreto’s blog for RDMA and Mellanox RoCe adapters. But since there is very little info with Emulex, I started this blog to write and share my findings.